There are lots of point-and-shoot cameras available, and while many good choices exist, it’s hard not to feel like they’re mostly the same. 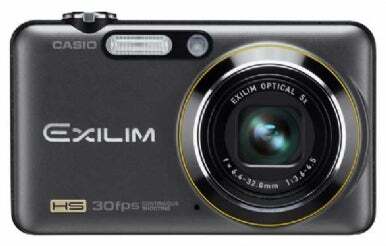 Occasionally, though, something unique comes along, and Casio’s Exilim EX-FC100 definitely falls into that category. As a point-and-shoot camera, the EX-FC100 is fairly typical: it has a 9-megapixel sensor, allowing you to extract large prints from your images, a 5x optical zoom for extra telephoto reach, a stabilized sensor for sharper handheld shooting, and all of the expected point-and-shoot features-scene modes, face detection, good metering, and autofocus. What sets the EX-FC100 apart is its ability to shoot bursts of up to 30 full-resolution images per second, and video at up to 1,000 frames per second (fps). While at first glance these features may not seem useful to the average shooter, the way Casio has implemented them will make them incredibly valuable to anyone who shoots moving subjects-children, action at a sporting event, wildlife, and more. Casio’s Exilim cameras are renowned for their incredible thinness, and while the EX-FC100 is a very small camera, it’s still larger than the smallest Exilim. That said, the camera is beautifully designed and has an extremely low profile. The EX-FC100 lacks any kind of moldings or handgrips, but it’s still easy to handle and comfortable to shoot with. The 2.7-inch LCD is bright and clear with nice color and good detail, but its images look a little soft. At first, this might make you feel like the camera’s autofocus isn’t working, but you’ll soon get used to it and learn to recognize what good focus looks like on the EX-FC100’s screen. Unlike most cameras, the EX-FC100 lacks manual shooting modes. The camera is always in auto mode, but it allows manual control of ISO, white balance, exposure compensation, and flash mode, and changing any of these parameters is very easy. Whether you’re a novice or have a little more experience, you’ll be able to pick up the camera and start shooting right away. In place of manual modes, the EX-FC100 provides a huge assortment of scene modes, or what Casio refers to as Best Shot modes. These modes tailor the camera’s settings to specific situations. While Casio has provided a Best Shot mode for seemingly every possible contingency, trying to figure out exactly when to use a mode like Autumn Leaves can be tricky. One impressive Best Shot mode is the Multi-Motion image mode, which quickly shoots a series of images and then composites them. For example, if you use it to shoot someone throwing a Frisbee, you’ll see one image with multiple Frisbees in the air, creating a stuttered trail. It’s not an essential feature, but it’s a lot of fun. The camera’s stabilization feature works well, and while the EX-FC100 lacks an optical viewfinder, the LCD screen is bright enough for use in direct sunlight. Autofocus and metering are both very good, and several focusing and metering modes are provided. Fortunately, Casio has eschewed some of the more gimmicky features (like smile detection) and stuck with technologies that actually work. To the left of the EX-FC100’s shutter button is a button labeled 30, which toggles the camera in and out of high-speed burst mode. In this mode, you can press and hold the shutter button for up to one second and the camera will shoot at up to 30 fps at full resolution. If you choose Fine quality (full resolution with the best quality JPEG compression), you’ll get only 21 fps, while Normal quality will yield a full 30 fps. For capturing the precise moment when a baseball bat hits a ball or a bird lands on a tree, the high-speed burst mode is invaluable. Obviously, storing 30 full-resolution frames quickly fills up your storage, so after the camera has taken the shots, it presents a simple interface for choosing only the frames you want to save, allowing you to zero in on the precise moment that you want. Near the left side of the top of the camera is a button labeled Slow, which gives you another option for capturing a precise moment. When you press the Slow button, the EX-FC100 captures one, two, or three seconds worth of full-resolution images at 30, 15, or 10 fps, respectively (you can choose which speeds using a menu item). It then plays these back to you on screen in slow motion. When you see the frame you want to keep, press the shutter button and the camera will store it. The EX-FC100 has a 2.7-inch LCD. These two features provide two approaches to the same problem, and both work well. Which one is right for you depends on the situation and your reflexes. With the 30-fps burst, you should be able to easily capture the moment when a runner’s foot hits home plate, while the Slow mode will work better for capturing the precise moment of impact of a ball and bat. My only complaint about these burst features is that they’re too fast for some situations. When shooting portraits, a burst mode can be handy for capturing subtle changes of expression, but expressions don’t change 30 times per second. A burst speed of 3 fps is fine for this type of shooting. It would be nice if Casio had included a slower, more traditional burst feature in addition to the high-speed features. Like most point-and-shoots, the EX-FC100 can shoot video (standard or high definition) with sound. Video quality is very good, although as with most other cameras, you cannot use optical zoom while shooting video. The EX-FC100’s video features exploit the camera’s ability to record full frames at high speed. In addition to its normal video mode, a separate High Speed video mode lets you shoot 480 by 360 video at 210 fps, 224 by 168 video at 420 fps, or 224 by 64 video at 1,000 fps. These videos are played back at a normal 30-fps rate, meaning these modes allow you to record slow motion. You’ll probably find the 210-fps mode the most useful, as it yields the frame size that’s closest to normal SD video. While the 1,000-fps mode is interesting, the extremely odd frame size and low-quality results make this feature only marginally useful. Slow-motion video is a lot of fun, and Casio has wisely put a dedicated external control on the camera for switching between normal and high-speed video. The fact that you can so easily get to all of the camera’s high-speed features makes you much more likely to take advantage of them, and I was pleased to see that these features didn’t require a trip to the menus. Unfortunately, two serious issues mar the EX-FC100’s video features. First, when zoomed in all the way with the camera’s optical zoom, the camera was incapable of accurately focusing. Second, when shooting HD zoomed in all the way, the camera produced a very weird shaky, wobbly image. It was hard to tell if this was the result of the camera’s stabilization or digital zoom features. Deactivating both had no impact. Of course, you can simply not zoom in all the way, as the camera worked fine when not zoomed fully. Note, too, that when shooting HD, you’ll have only mono audio. The EX-FC100 delivers very good stills. Plainly, Casio has not scrimped on the lens, as the FC100 produces images that are sharp, as well as distortion and vignette free. High ISO performance is very good, but as one expects from a point-and-shoot camera, once you get over ISO 400, the images become noticeable noisy. However, even at ISO 1600, the images are still quite usable, especially if you’re printing small. Except for the shaking problem mentioned earlier, video quality is very good, but when shooting video at higher ISOs, the camera has a tendency to dramatically underexpose. The slow-motion video is lots of fun, and a great way to jazz up your movie projects, especially when shooting action. Be warned, though, that the camera does have some troublesome issues when shooting regular-speed video. For users who often shoot action, the EX-FC100 presents a great solution to difficult shooting issues.